basically, you take a basket or a box, walk through your space, and deposit anything in there that you see that you know you don’t want anymore. there are several questions people suggest to ask about your stuff as you do big purging, but that’s not really what a “blaze” is about. it’s a quick discard of stuff that’s just taking up real estate in your home, that you KNOW is just taking of real estate in your home, and that you don’t have any problems finally just removing it without waiting until you reach that certain room to organize. if you know you’d toss it at first glance, or would experience no pain letting it go, then just do. go room by room. the items will jump out. you put them in the box. you eventually fill the box and donate/give it away. you can do this concept in several rounds. i’m learning i can get rid of a lot of stuff without committing a ton of time and, more importantly, emotional energy. because let’s be honest. that’s the energy that really makes “purging” hard. these are easy, painless decisions that make a big impact. 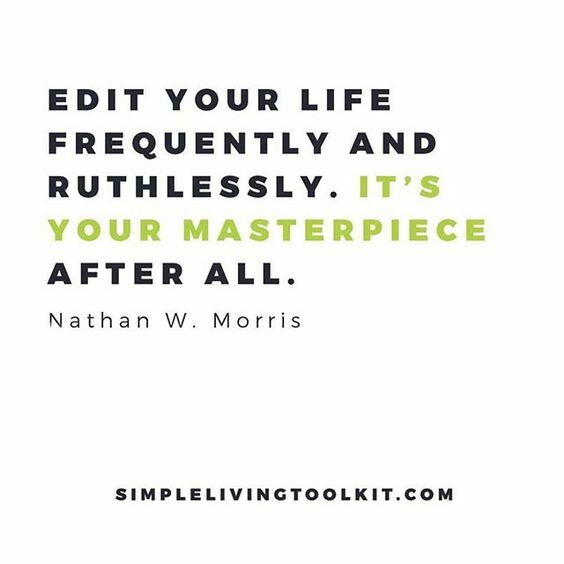 you are taking baby steps to edit your life, which nathan morris (whose actually a financial coach, not a stuff coach, but hey, it’s kinda the same) says to do.